I’ve got a smaller update this time. Just a few ZX conversion tweaks. Fixed Floyd-Steinberg dithering in ZX modes. It should be much less blocky. Added ZX Spectrum 8×2 mode (8×2 pixel attributes). Added Bayer ordered dithering. It’s more easier to use in ZX modes than Floyd-Steinberg, because it operates on a single pixel without analysing the rest of the image. ZX Spectrum 2-color per attribute limit makes implementing Floyd-Steinberg dithering quite problematic, because it’s only possible to distribute error to nearby attributes that have the same palette. That’s not a problem with Bayer dithering due to lack of error distribution. 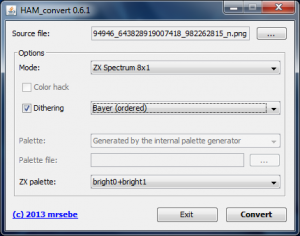 Added choosing what palette to use with the ZX conversion (bright0, brigth1 or both of them). ZX modes are still experimental and need more work. 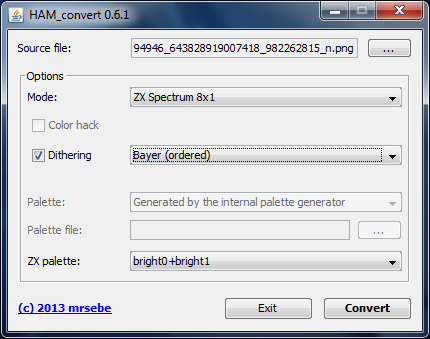 Bayer dithering seems to look better with only half of the palette (bright0 or bright1). This entry was posted in Computers, Java, Personal blog, Retro equipment and tagged Amiga, dithering, HAM, ham_convert, HAM8, Hold-And-Modify, java, zx, zxspectrum by mrsebe. Bookmark the permalink.